That is an excerpt from one of my kids’ favorite books when they were little. We read it so many times that we memorized it and would holler out random lines during the day just to make each other laugh. If I had to, I could probably still quote the whole thing (along with “Fox in Socks” to tell the absolute truth). I like to set goals. As a “type A” listmaker, goals are important to me. Rather than showing me how far I have to go, goals generally give me incentive to improve and grow so long as I set reasonable ones. The only time when that works against me is when the timeframe to reach those goals extends too much past my original outline. Each goal is a bear hunt, and the obstacles are the techniques I need to master to get to the bear cave. Take too much time, and I lose heart. Giving up is like running from the bear. You’ve put yourself back at square one with only the adventure to show for it. Recently I discovered that the biggest obstacle I have is myself. There came a time when I realized that I haven’t improved much in recent months on a piece I have been working on for over a year. Moreover, there’s still a long way to go in my perspective to get to performance level on it, which is the ultimate goal. As the potential performance time began to approach, my panic grew and I really began to reconsider whether violin is for me. Forget the fact that I haven’t been practicing as I should, right? Rather than take the hint offered by my teacher’s gentle nudges about playing with a metronome, or using more bow and paying attention to the dynamics & articulations, I continued to practice as I had in the past and expected to get better. When that miracle never materialized, I actually considered quitting. Why wasn’t I practicing the way I should? To tell you the truth, I was afraid (still am, a little). I didn’t want to practice with the metronome because it is tricky. Using more bow feels weird. Releasing right-arm tension is really challenging. For a while there I thought it would be easier to fail than to fix the issues that are holding me back. So I moped, and I cried about it, and I whined on the internet. The other day I saw someone brave enough to record themselves playing the same piece and post it on the internet. It wasn’t perfect, but it demonstrated a good mastery of some of the techniques I clearly was not applying, and it sounded good. Inspired, I recorded my version and requested critique. What I got back was a collection of extremely well thought out opinions that reflected the direction my teacher has been trying to get me to take on my own. Rather than feeling defeated by this, the experience really helped me recognize why the steps I had been skipping were so important. The nicest part about it was realizing that I’m doing more right than I was giving myself credit for. Honestly, the piece could sound better at this point, but it definitely doesn’t sound as bad as I thought – something my critics pointed out as well. Sure, we all want to get to the bear, but first we have to swishy-swashy through the meadow, squelch-squerch through the mud, splash-splosh across the river, and stumble-trip through the forest. Sometimes that means pushing past our comfort level. 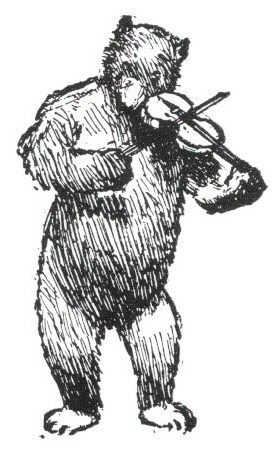 It’s going to be tricky, weird, and challenging; but in the end I’m going to find that bear and we’re going to make beautiful music together. Oh Krista, how true everything you say is! As an adult student of around 6 years, I have also held myself back by not applying advice during lessons. It took a serious look at myself last year to work out what was wrong. Before that, I had been muddling through the work and improving but very slowly. Sometimes I would work on the same pieces for over a year as my teacher would not let me move on unless it was correct in most details. Of course I would lose interest and the music would stagnate because it all took too long. I would continue to hear the same advice such as 'relax your bow arm weight more', 'don't press so hard with your left hand fingers' and 'practice your double stops more often'. etc, etc. I worked out that it was my inner voice doing the damage. Almost by rote I could counter my teacher's advice with the same sentences. 'I can't stay relaxed for long', 'I can't contort my hand like that on those double stops', ' I'll never be able to master vibrato properly', etc etc. Since then I have been careful to be much more positive, thinking, 'yes, that's doable', 'I can try that', 'I should be able to work my way to that point'. No negatives allowed, any more. That attitude check worked almost immediately. How simple it would have been if I'd been conscious of it in the first place! This is actually a comment to your previous blog. I just realized teacher does more for a student when the student is a child. I recently saw a youtube video of a girl playing, before she played, her teacher tuned for her, but the intonation of her playing was almost flawless. That tells me her teacher must have worked her a*s of helping her play in tune. That's probably the case when it's a kid learning. Adult learners on the other hands are expected to be able to do a lot on their own, simply because we are grown up, and can manage life on our own.